Hello and welcome to RefrigerantHQ! If this is your first time here, I’m happy to announce that this is a great first article for you to land on. If you’re a recurring visitor, I want to say that I’m excited to share with you something I’ve wanted to publish for a long time: an ultimate guide to ductless air conditioners. 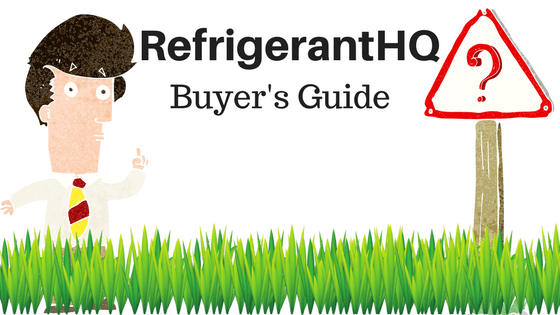 As RefrigerantHQ continues to become more popular, we want to make sure that our articles are the most in-depth you’ll ever find on the Internet. So make sure you check back often for more guides like this. 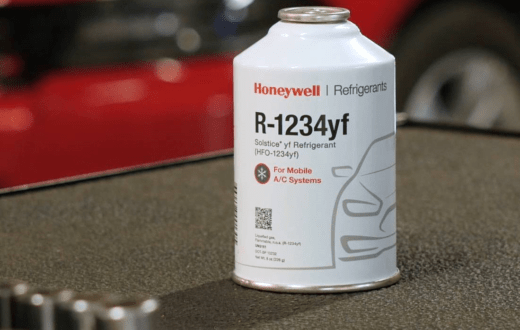 Alternatively, we always have a fresh round of articles pertaining to refrigerants to include news, product reviews, and various pieces of information relating to all-things air conditioning. Before we get started, take a glance at these amazing ductless air conditioners on Amazon. That’s what you’d see if you typed in “ductless air conditioner” in the Amazon search area. I want you to see what they look like and get acquainted with them. Look at the different types, sizes, and colors. It’s good to see what they look like before I go into great detail as to what they are, what they can do for you, and other things relating to them. I personally love to use Amazon when making a purchasing decision as I can see all of the specifications on the product, tons of pictures, and best of all various product reviews. It allows me to make an informed decision when I decide to purchase. This guide, as you’ll soon see, is structured in a first, middle, and last type of format. First, it’s important to learn what ductless air conditioners are. You’ll learn such things as their benefits and drawbacks. Then, in the middle portion, you’ll learn how they work and how to install them. Finally, you’ll learn the types of ductless air conditioners that are good for your situation (because everyone’s situation is different). And you’ll also read what I believe are the best ductless air conditioners you can buy. By “best”, I based this off of what people say on Amazon. After all, if 1000 people say a product is the “best ever”, it probably is! How does that sound? This article is meant to be read chronologically; however, feel free to go right to the section you’re concerned with. If you want to know the benefits to ductless air conditioners, you can skip to that section. If you want to know the best ductless air conditioners, you can skip to that later section as well. This is a resource for you. Do with it what you want. Our main concern with this guide is providing you the best information we can about ductless air conditioners. As a whole, we are concerned with providing you the best information we can with everything relating to refrigerants (and that includes all types of air conditioners). So, without further ado, let’s jump right into our first section! So, what is a ductless air conditioner? What makes it different from an HVAC system, or a portable air conditioner? Out of the three words, “ductless” is the keyword. To understand what a ductless air conditioner is, you must first know what ducts are and how they function. Do you have an HVAC system? If so, you probably have an air duct that snakes throughout your home. These air ducts open each in many rooms in the form of air vents. This is the system that essentially moves air around the home. 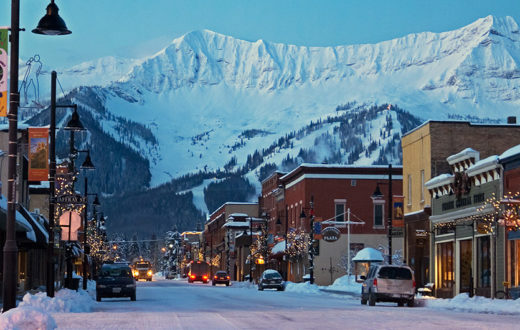 An HVAC system is not required if you want to live in a temperature-controlled climate. That’s where alternate forms of cooling come into play, such as with a ductless air conditioner. So say goodbye to ducts. You don’t need them! Ductless air conditioners are commonly called mini split air conditioning systems. This is because the ductless air conditioner is two separate, but connected units. You’ll understand this better when we get to the “how they work” section. For now, know that one of the units is indoors and the other unit is outdoors. The article continues to talk about the benefits and drawbacks of ductless air conditioners (but we’ll talk about that soon). For now, the important thing to know is what they are and why you would buy one. Extending the home is a perfect example! Let’s say a growing family needs a home with more space. They have two options: move to a new home to make their current home bigger. It’s not uncommon that the homeowner could create an addition to the home. When they do, they’ll be happy with an extra bedroom, a bigger kitchen, or a larger den. There’s only one problem: the new room is not part of the air duct system! This presents a unique challenge to the homeowner. What happens in the summer on a hot and humid day? The room would be almost unbearable to spend time in. A wall fan isn’t going to do the trick. The homeowner has a few options. They can extend their duct system to the new room. Or they buy a mini split, portable air conditioner, or window air conditioner. Extending the duct system to the new room would probably be the most expensive option. Furthermore, there could be a loss of air strength in other rooms since the HVAC system will be stretched to the additional room. Because this guide is geared towards ductless air conditioners, we are going to focus solely on that option. And let’s be honest folks, if it was me I would go with the ductless as well as I like the idea of saving the money of routing the extra ducts. Next, we are going to talk about the benefits of ductless air conditioners. And there are many benefits! Let’s take a look at what those might be. Money savings and flexibility are the two main benefits (outside of cooling a room) of mini split system. Let’s take a deeper dive to better understand why a ductless air conditioner can save you money on your monthly energy bill. If you’re like me, you like to save money. Think about it. If you really tried, I bet you could save at least one hundred dollars each month by making a few adjustments. You can cancel cable in favor of a streaming platform like Netflix. You can make more meals at home instead of eating at restaurants. And you can use a ductless mini split more often than using an HVAC system. Let’s focus on the third point, which is the topic of our guide. It boils down to this: you are charged for the amount of energy you use. What uses more energy, an HVAC system or a ductless mini split air conditioner? To answer this question you need to know how much energy the HVAC system or ductless mini split air conditioner uses. But I think it’s safe to say that the HVAC system will almost always use more energy. They are normally more powerful and therefore use more energy than ductless mini split air conditioners. Running a ductless mini split air conditioner will then translate into you saving money. The downside is you are only able to run the ductless air conditioner in one (or a couple) rooms. That information presents an important fact about air loss. In HVAC circles, the term is air leakage. Nevertheless, you won’t have that problem with a ductless mini split system. The air goes straight from the system into your room! There are no ducts to patch. We’ll learn more about how mini splits work soon. Another reason to use a mini split system is if you spend most of your time in one specific room. Why turn on an HVAC system that will cool the entire house if you’re not using the entire house? That’s a waste of energy! And when you get your monthly energy bill, you might regret using that much energy, especially in the summer. There are many times that I’ve opened my power bill after a hot July and recoil in horror at the price. 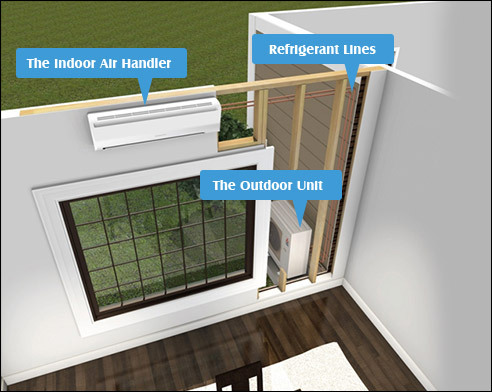 A mini split system can, to a degree, compliment an HVAC system. Let’s say your HVAC system is old. Over time, the HVAC system might lose some of its strength. Running a ductless air conditioner will give the HVAC system a break so it won’t have to work hard at all times. Still, there’s another financially-smart reason to buy a ductless mini split system. You may get a tax credit! There are, at times, financial incentives to buying certain appliances or systems for your home. These incentives can come from the federal, state, or local government. Sometimes incentives are offered through your local energy company. So make sure you stay up-to-date and check with them! What is the rebate, tax deduction or credit, or incentive for anyway? 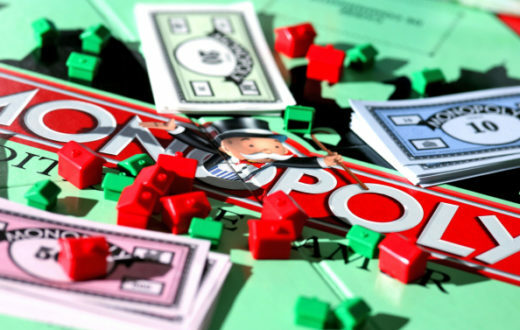 Tax deductions and tax credits are not always available. Neither are rebates or incentives from your local energy company. Therefore, and as you read this, make sure you check with them! Give your local energy company a call to see what deals they have available. You might be surprised by what they offer. Please remember that you won’t actually buy the ductless mini split through your local energy company. We’ll talk later about how to find the best deals on ductless air conditioners. The important thing is letting your energy company know you now own an energy efficient air conditioner. And they might grant you some type of incentive. Let’s now take a look at the third benefit to owning a ductless air conditioner. You’ll have the flexibility to move it around. When it comes to flexibility, ductless mini split systems are right between HVAC systems and portable air conditioners. An HVAC system is stationary. It isn’t going anywhere! And there’s no reason to move it around to a different room or otherwise. The HVAC system is connected in part via the duct system. On the other side of the spectrum, you have portable air conditioners. These are extremely portable units which you can freely transport room-to-room and home-to-home. Most of them are not as powerful of ductless air conditioners, however. And, portable air conditioners are most often noisier than ductless mini split systems. Speaking of “mini split”, recall that I said one unit is indoor and one unit is outdoors. Guess which unit is the loud one? The unit outdoors is the loud one! That’s perfect for many reasons, which I’ll touch on later. Let’s ponder on the tubing or conduits aspects for a moment. You can add more tubing or conduit if you want the indoor unit moved! That alone attests to the flexibility of ductless air conditioners. And using our example from before, about adding a new room to a home you would have the option of moving the unit to the new room. Ductless air conditioners are turning out to be a great air conditioning solution! But what are some possible drawbacks? Are there cons to owning or buying a ductless air conditioner? You guessed it. Just like with anything, there are always drawbacks. And some of it depends on your current situation and your personal or family needs. Let’s dig a little deeper to learn about the possible drawbacks of ductless air conditioners. Most major appliances or systems need to be maintained at some point. So it should come as no surprise that the ductless air conditioner needs to be maintained as well. After all, HVAC systems, portable air conditioners, and window air conditioners need to be maintained as well. People want convenience. I’m not different! If I’m going to spend money on something, especially something that might be pricey, I want to “set it and forget it”. I don’t really want to spend more than money (I’m talking about time) working on a system, especially if I’m not familiar with maintaining such a system. There is light at the end of the tunnel, however. You don’t necessarily have to maintain your system. You can pay someone else to do it! And by that, I mean a professional, similar to an HVAC technician. If you are unfamiliar with maintaining systems like a ductless air conditioner, it’s probably a good idea to just leave it to the professionals. I’m not going to talk about how to maintain a ductless mini split system, yet. After all, I have an entire section that will talk about that! So let’s move right into the next con. What do you like about your home? Do you like everything to have its place? Does everything need to look neat, organized, and aesthetically pleasing? Depending on your room, a ductless mini split may or may not look good in your room. It might not match the overall color scheme. It might be too “blocky”. Or there might be another reason it “doesn’t match” with the rest of the room. I’m talking about the interior unit here. There are also aesthetic concerns relating to the outdoors unit. So there you have it. There are interior and exterior concerns when it comes to the look and feel of the ductless air conditioning system. When holes are drilled, walls are penetrated, pipes are fitted, will it still look good afterward? In a perfect world, the answer is yes, of course. But this isn’t a perfect world. The good thing about the look of the interior unit is that you get to choose which one it is before you buy it (obviously). When you’re shopping, I’m sure you’ll consider aesthetics as you go through your options. And we’ll share some favorite ductless mini split systems later. Let’s first talk about the third con of buying a ductless air conditioner: upfront cost. The key words here I want you to focus on are “at first”. Remember those. I’ll get back to those soon. But for many people, they might look at the initial cots of buying a ductless air conditioner and take a step back. At that point, they might look into other options such as replacing their HVAC system or researching portable air conditioners. 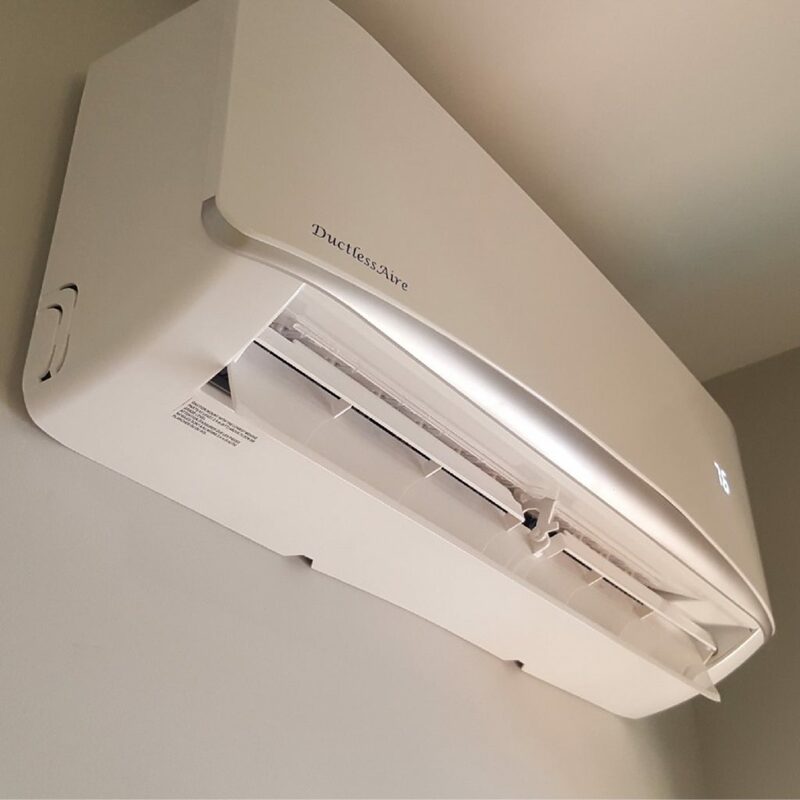 The thought of “expensive products” can immediately make a person more reserved; however, you can find quality ductless air conditioners and not pay a large amount of money for them. So, how much do mini splits cost? Sure, you can find great ones that cost thousands of dollars. But, as you’ll read more about later, it’s possible to find a very nice ductless air conditioner for under one thousand dollars. Now, do you recall when I said to remember the words “at first”? In context, it was “mini split systems can be expensive at first”. What did I mean by that? I’ll tell you. Sure, you might pay one or two thousand dollars up front. However, over time, you’ll be saving money. How is this possible? Because you’ll be using less energy by using a ductless system and an HVAC system! The article from HGTV continues “you’ll get lower energy bills in return, but the payback period depends on your climate, your use of the system, and your local electricity rates”. So there are a few different factors at play here. It’s always a smart idea to think long term. Think about delayed gratification. Sure, the ductless air conditioner is going to cost you money. But, over time, it will save you money on your monthly electric bill. If you own it long enough, it just might pay for itself! And now, let’s get into some technical things. It’s time to learn about how ductless mini split air conditioners work. It makes sense to know what the parts are before you can understand how they interact with each other. I already gave a top-down view of mini split systems when I said one unit is indoor and the other is outdoors. This is very important! And you’ll know why once I get to how it works. But first, let’s take a look at the different moving pieces of this amazing air conditioning system. The ductless mini split is two separate parts; however, they are connected. The outdoor unit includes an inverter-driven variable speed compressor, a condensing coil, and an expansion valve and a fan which cools the condenser coil. The indoor unit includes the quiet oscillating fan and an evaporator. In addition to the indoor and outdoor units, they need to be connected somewhere. That’s where the refrigerant line-set comes into play. It’s made of insulated copper tubing, which protects the liquid/vapor. 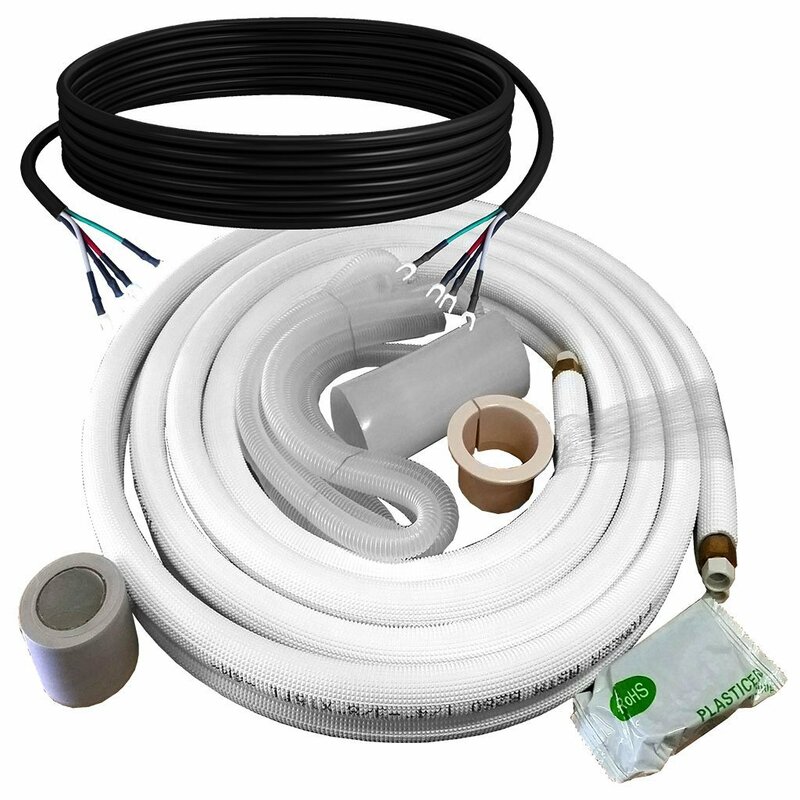 The insulated copper tubing is enclosed in a conduit next to both a power cable and a condensation drain. You could technically include a remote control (which is often included) as one of the parts do ductless air conditioners. They need no special introduction other than what they do: turn on and off the ductless air conditioner. The remote control sometimes has additional features, however. We’ll talk about those later when we talk about the best mini split products on the market. So we have the compressor, condensing coils, expansion valves, insulated copper tubing, and more! I hope you like mechanical systems because you’re about to find out how these different parts work with one another (if you don’t know already). I suppose many people will press the “on” button, feel the cool air, and move on about their day. There’s nothing wrong with that! For those who want to know the how, keep reading. It comes down to a matter of science, actually. You also need to know the refrigeration cycle. The moment you press the on button, the gears start spinning. 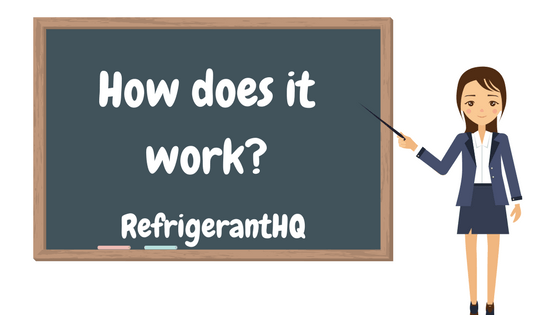 The story of how the ductless air conditioner works is actually the story of how refrigerant works. 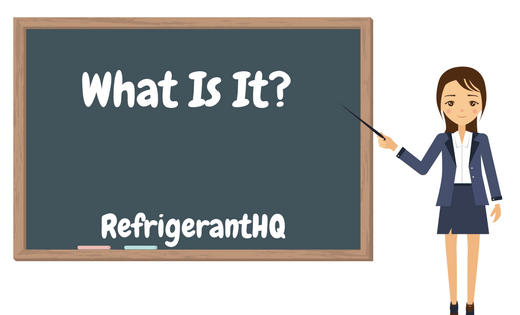 And, as you know, we love talking about refrigerants here, seeing as how this is RefrigerantHQ! Now that we know how mini split systems work, it’s time to understand how to install them. There are a few caveats here. Chief among them is that you don’t need to install it yourself. This is very important to know. Do you have a local HVAC company? Here’s an idea, you can have one of their technicians come out and install it for you. The best part is that the price might be negotiable. And you won’t know unless you ask! The ductless air conditioner will come with instructions. After all, is a major system. What major system or appliance doesn’t come with an instruction manual? 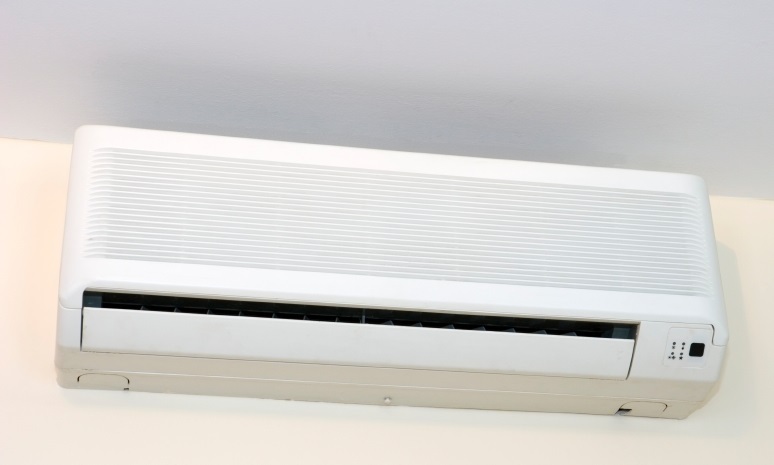 There are many types of mini splits or ductless air conditioners on the market. Therefore, it would be difficult to write about a one size fits all type of section here. However, we can give you an overview of what to expect when installing a mini split system. What good is your installation attempt if you don’t have the proper tools? Start off on the right foot by having everything you need. If you do, you won’t have to run to the hardware store in the middle of your install. 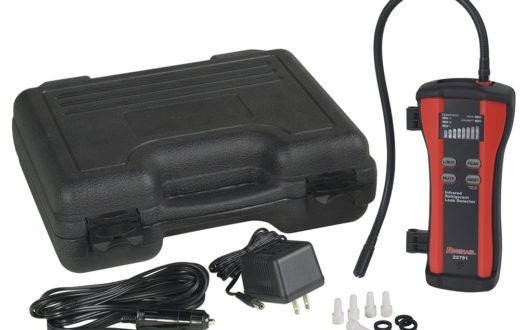 You can have your tools on hand even before your mini duct system arrives. Just search online for installation manual of the ductless air conditioner you are ordering. It’ll list the required tools and anything else you might need. A wall bracket helps the indoors unit stay attached to the wall. As you read in the instructions, the bracket should be installed higher up on the wall. Make sure the outdoor unit will be closeby on the other side of the wall. This will mean you’ll have to use less pipe to connect the two units. Now that the wall bracket is in place, it’s time to attach the indoor unit. These units aren’t light, so you want to make sure you secure it tightly. This will mitigate any possible falls of the unit, which would cause an accident. If the indoors and outdoors units are directly on opposing sides of the wall, you won’t have to use lengthy piping. Try to keep the piping and drain hose as close to the wall as possible. You can even secure it in place by using metal brackets. You’ll mount the outdoors unit in a similar way you mounted the indoors unit. Remeber, these steps are a general overview and each ductless air conditioner is different; therefore, you’ll need to refer to your specific instruction manual. The outdoors condenser unit will probably include a support piece, cross support piece, and many screws, bolts, and brackets. The outdoors unit is the heavier of the two! This is the step where is most important to defer to a licensed electrician or other professional if you’re not used to electric work. The electrical components will need to be connected to the outdoors unit, indoors unit, and, most importantly, the electric power supply or electrical box. Finally, all you need to do at this point is press the power button! Does it work? If so, you’re going to have a very enjoyable environment and atmosphere in the room it’s installed in. Conduct a comprehensive check of the remote control and the system for full functionality. Another note, and an honorary mention, is that you can set up WiFi in some units. You’ll be able to operate the ductless air conditioner from your smart phone. Let’s say you turn your mini split system off during the day while you’re at work. Before you get home, you can remotely turn the air conditioner on and the room will be nice and chilly by the time you get home! Technology is amazing. And we want to make sure your ductless air conditioner lasts as long as possible. That’s why routine maintenance is required. Let’s take a look at what that entails. There are numerous parts to keep clean so the mini split system runs at optimal performance. Clean dust and debris on the outside of both units, indoors and outdoors. An accumulation of debris and make its way into the unit and cause backups and stoppages. If left unchecked, it could cause a complete system failure. What happens when you fail to replace an air filter in your car or furnace? It doesn’t work as it should! If the air filter gets caked with debris over time, the mini duct system won’t get enough air. At that point, there might be some type of system failure. Replacing air filters is one of the easiest and cost-effective ways to keep your system running healthy not to mention keeping the air flow quality! It’s important, especially in the winter, to check for any ice buildups. Ice can cause a multitude of problems including covering where the air should be entering or exiting the system. Leaks are another hazard to watch out for. This is especially true when you look at the piping of the mini split system. A quick check of the pipes can potentially save the unit from future failure if any problems are spotted early on. If you find that you have a leak please remember that the last thing that you want to do is dump more refrigerant into the system. Refrigerant is the lifeblood of your air conditioner and if it is leaking out then you have a problem. Simply ‘recharging,’ the unit without fixing the leak will not solve the problem. Instead, you’ll be back to where you were in only a few days or weeks depending on the size of the leak. The correct approach here is to identify where the leak is and then fix the leak. For help on identifying leaks and where to find them check out our ‘What’s the Best Way to Find a Refrigerant Leak,‘ guide. If you aren’t familiar with maintaining a mini split system, you’re in luck. You don’t have to maintain it if you don’t want to! Well, the maintenance still needs to happen; however, but you can hire a local technician and they will come to your home to do the job. Most of the time this is your best option as you never want to guess your way through something like this as you have already invested a significant amount of money into the machine. It would be terrible if you did something to break the air conditioner accidentally because you didn’t know exactly what you were doing. There are a number of reasons why hiring a professional technician is a good idea. First and foremost, the answer is in the word “professional”. 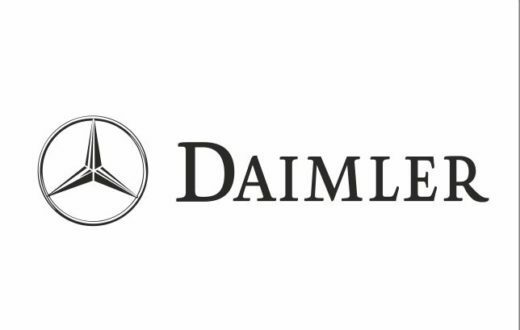 They know exactly what they’re doing and probably have years of experience working on air conditioning systems. It’s their job! Another reason is that that might know tips and tricks that are in addition to what’s available in the instruction manual. The HVAC technician industry exists for a reason: most people t either don’t want or know how to maintain their systems. Some people might be interested but just don’t have the time. At the end of the day, the important thing is that your ductless air conditioner gets the maintenance that it needs. If you’re going to pay money, and sometimes good money, for a major appliance or system, you might as well do everything you can to extend its lifespan as much as you can. And proper, regular maintenance is just the trick to doing that. Cost, or price range, will probably be the first factor you consider when shopping around. Are you willing to spend in the three-to-four thousand dollars range? Are you willing to spend in the one-to-two thousand dollars range? Depending upon the range you’re in, there will still be numerous options for you to choose from. Here’s something for you to consider: a more energy efficient model might be just out of your price range. But when you do the math, considering monthly energy bill payments, which option will eventually be more cost-effective? For example, let’s say there are two models, one for two thousand dollars and another for two thousand five hundred dollars. What if the more expensive one will save you fifty dollars each month on the energy bill? Well, within a year, the more expensive option would actually be the less expensive option. Sometimes it pays to do the calculation and see how many months it will take to get your return on investment. Mini split systems are not equal when it comes to cooling power or the ability to cool rooms of different sizes. How many square feet do you want to cool? Take a look at the ductless air conditioners on Amazon. You’ll notice that they either display the square footage or the “BTU”, which stands for British Thermal Units. To learn more about BTUs, read our article “What are Air Conditioner BTUs?“. Reading that article will give you the tools you need to know what BTU number is right for you. Along with price, the strength of the ductless air conditioner is going to be one of the more important factors you’ll use to choose. You don’t want to buy, install, and find out the mini split system isn’t strong enough for the room. That’s too late! If you end up with a unit that’s too large for your room then you’re going to be wasting energy as well as ending up with hot or cold spots throughout the room. 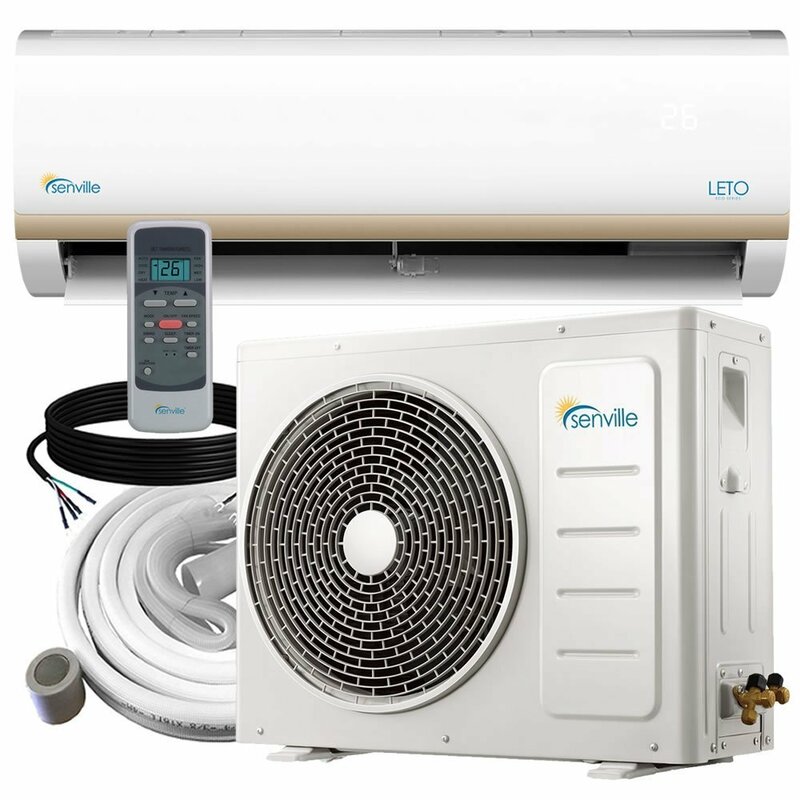 On the inverse of that if you purchase a unit that is too small for your room then the air conditioner will be running constantly causing your energy bills to go up and up. On top of that your room will never fully be cooled. So please ensure you do the proper research before you buy your mini split system. Some people only need it the air conditioner to turn on and cool the room. Others prefer their unit to have a timer, include a remote control, or have additional features such as heating mode. Like anything, you’ll probably get what you pay for. So if you’re a fan of “bells and whistles”, it might be a good idea to spend a few hundred dollars more. You never know, the higher priced model might be more energy efficient. And, like we learned earlier, you might even be saving money over time in the form of lower monthly energy bills. How Long the Ductless Air Conditioner Will Last? This is very important! How long will the mini split system last, on average? You’ll want to review different pieces of information here. Chief among them is to know both the warranty details and what other people are saying about the mini split system you’re considering. Both can be found on the Amazon product page. Normally, a warranty will be for two or three years. I would recommend going against buying a mini split system that has a warranty of only one year. What good is the air conditioner if it breaks after one year of use? You’d have to buy the unit every year! Some people, as you’ll read, buy the extended warranty. This might be a smart option, especially if you’re going to buy a more expensive mini split system. Speaking of the “right” ductless air conditioner, let’s take a look at the last section: our favorite products. Finally, we’re excited to share our top 5 picks! Now, we’re basing our “top 5” on Amazon customer reviews, score, and through our own individual research. If you’re in the market for a mini split system, you might as well start with the most popular products! Let’s take a look. Ductless air conditioners can be quite loud; however, the INNOVA Mini Split is different. You might use this unit for a home office. If that’s the case, you’ll want it to be as quiet as possible. Or, you might be a light sleeper. Either way, the silent operation feature of this unit is perfect for situations that need a system which is quieter. Does your room get humid? The INNOVA Mini Split will mitigate that. It functions as a dehumidifier! You don’t need to buy separate air conditioners, heaters, and dehumidifiers. With this unit, they are all included. That also has the added benefit of taking up less space in your room. LED panels are great because they provide valuable information. On the INNOVA Mini Split, the LED tells you the current temperature of the room. Here’s the cool (no pun intended) part: the LED temperature is displayed only when the unit is on. This ductless air conditioner weighs ninety-five pounds during shipment. So make sure you have something like a dolly to be able to move the box around before installing the system. “Whisper-quiet” operation is ideal for any major system or appliance in your home. This is especially true if the ductless air conditioner is going to be installed in your bedroom. No matter which room it’s in, you’ll have the peace of mind knowing the mini split system won’t bother you with too much noise. Maybe you want to catch a game on TV, or talk on the phone, or sleep. Either way, you’ll be able to those with no problem. Having an option for three different speeds is powerful for a few reasons. One of them is related to your wallet. You can choose to run this ductless air conditioner on the lowest setting. This will use less energy, which in turn translates to a lower monthly electric bill. Or, on hot days, you can toggle the unit to blast air on its highest setting. This choice will cool the room the fastest. If you aren’t sure which to choose, you can always meet in the middle and use the standard cooling option. It’ll still get the job done. Some ductless air conditioners come with washable filters. This means that you don’t have to keep buying new ones if you want clean air. You can just take the washable filter out and clean it! It’ll probably consist of running it below a water faucet. Just to be sure, check the maintenance manual for specifically how to clean it. I would argue this is one of the main features of the MRCOOL Mini Split. You’re going to save hundreds of dollars by installing it yourself! And if there’s a ductless air conditioner for beginners, it’s this one. No special tools and the ability to have it up and running in a few hours is a major plus. Another feature of this mini split is that it doubles as a heater! That means you won’t have to buy a separate system for when it gets cold in the winter. Simply press the heating mode on the remote control and you’re on your way to a comfortable room temperature. This ductless air conditioner (and heat pump) runs at twenty-four thousand BTUs. That means it’s powerful enough to cool (or heat) large bedrooms, living rooms, and office rooms. The higher up we get on our list of favorites the more often you’re seeing quiet operation mode. It makes sense since quiet operation is a key benefit to the ductless air conditioners people love. And people do love this one. As a matter of fact, as of this writing, the Senville Mini Split has nearly four and a half stars, out of five on Amazon. This ductless air conditioner comes with an infrared remote control. Infrared is an area of the light spectrum that people cannot see; however, some animals can see it. This infrared remote control senses electromagnetic waves, which allows it to show a better estimate of the temperature of the room. Therefore, you’ll be able to program your air conditioner to exactly the temperature you want. These systems can be quite heavy. It’s a breath of fresh air knowing that this one weighs only sixty-six pounds. You probably won’t be installing this mini split system; however, if you were, it would be easier than other mini split systems due to its lighter weight. The product description page on Amazon notes that this product should be installed by a professional. You can’t go wrong with this “Amazon’s Choice” product. It’s not only Amazon’s choice. It’s ours as well! There are eight different power levels (and price) to choose from. 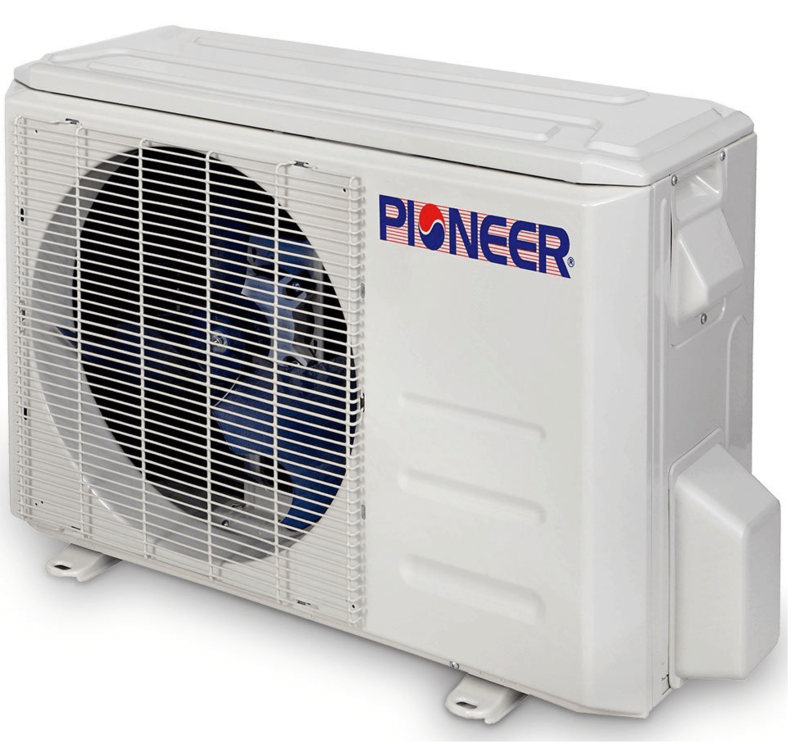 The PIONEER ductless air conditioner offers the ultimate when it comes to power customization. Includes installation, troubleshooting, and support hotline. The fact that this system weighs only nineteen pounds should come as a surprise to many people. After all, many ductless air conditioners can weigh up to seventy or eighty pounds, or even higher. Nineteen pounds is easy for most people to pick up; therefore, this ductless air conditioner should be easy to transport around. On the Amazon page, PIONEER advertises “Unsurpassed support hotline covering installation, use, troubleshooting, warranty and parts issues.” That’s a big deal to a lot of people. Have you ever called a company, only to find yourself speaking with a robot on the other end of the phone? It sounds like that won’t be the case when you contact PIONEER for assistance. This is a huge help, especially during installation. We’ve mentioned that many of the higher-tier models come with some type of quiet operation. And this product is no different. Check out the reviews on Amazon. People who have bought this mini split system are satisfied with how quiet it is. And that makes a big difference throughout the day or night. 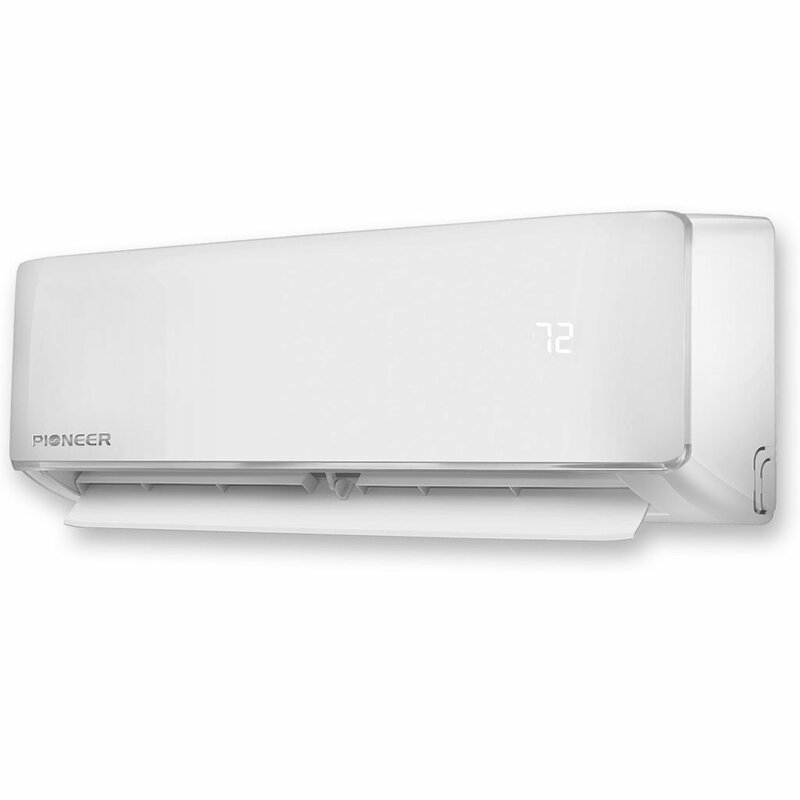 Also, like some other quality mini split systems, the PIONEER ductless air conditioner has a heating ability. It makes a big difference when you’re able to use the same system for heating or cooling depending on how the weather is outside. A couple other things to note are the reviews and “questioned answered” on the Amazon page. PIONEER ductless air conditioner has over one-thousand answered questions. That’s a massive number! In addition, this product has nearly five-hundred product reviews! For that many reviews, and the product to score so high, it just goes to show how popular it is. After all, it’s “Amazon’s Choice” as the ductless air conditioner to buy. And, as we learned earlier, there are models and power levels for any budget. Well, there you have it, folks! I hope that you enjoyed this ultimate guide to ductless air conditioners. And I also hope that you now have the tools you need to make the right decision when buying the perfect mini split system. Now, you know what ductless air conditioners are. You know their benefits and drawbacks. You also know how they work, how to install them, and how to maintain them. We’ve even shared our top five picks to give you a head start when making your choice. After reading this article if you find that you are still leaning towards a different alternative air conditioner such as a portable or window unit consider checking out our best of guides on these. Click here for our best window air conditioner article and click here for our best portable air conditioners. There are many ways to stay cool nowadays, the question is which one will you choose? If you have any further questions about ductless air conditioners you can contact us. Also, if you want more guides and articles like this, make sure you subscribe to our email list. As always, thanks for reading! And make sure to return in a few days for a new article from RefrigerantHQ. What are Air Conditioner BTUs?